Hi everyone! 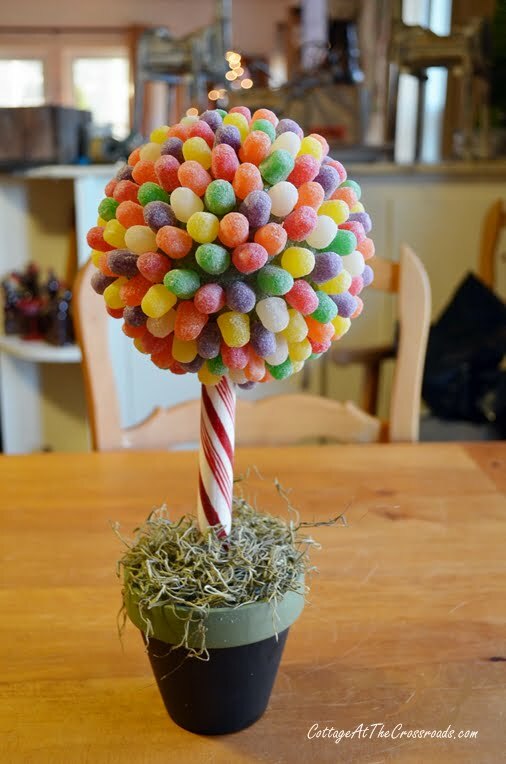 I wanted to share with you a little gumball (spice drop) topiary that I made recently. I made it for our kitchen to go with the gingerbread theme that I have going on in there. I was inspired to make one of these after seeing a similar one that was shared on Facebook. I’ll show more of our kitchen decorations soon but for now, I’ll just show you how I made this topiary. 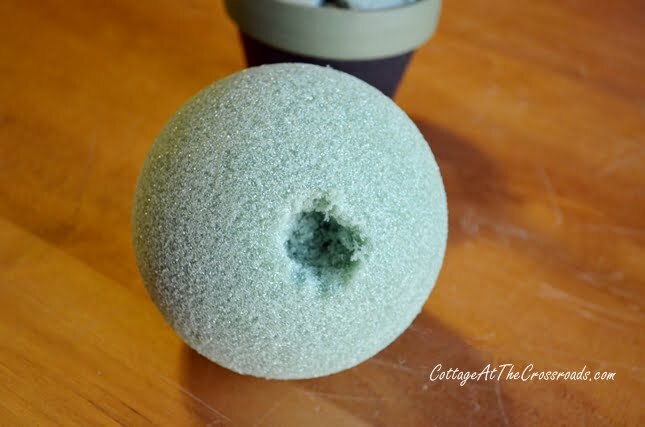 I used 1 1/2 bags of spice drops for a 6 inch Styrofoam ball, but the amount will depend on the size of bag and the diameter of your ball. 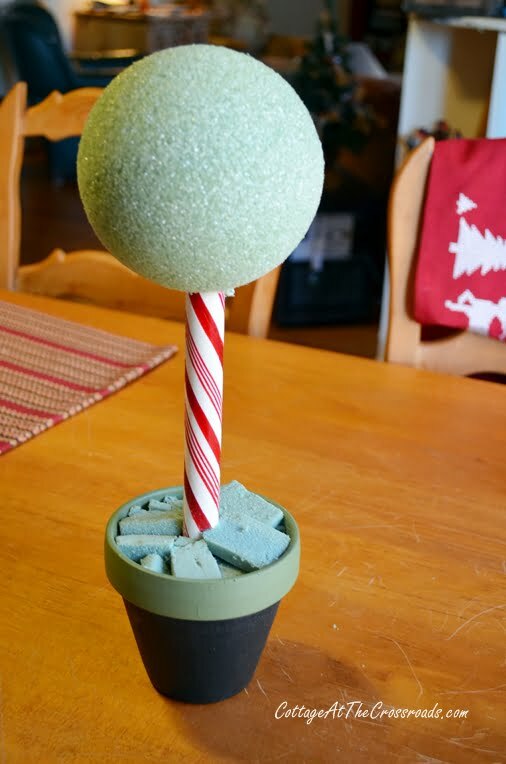 I used a terracotta pot that was already painted black and green and a thick candy cane. 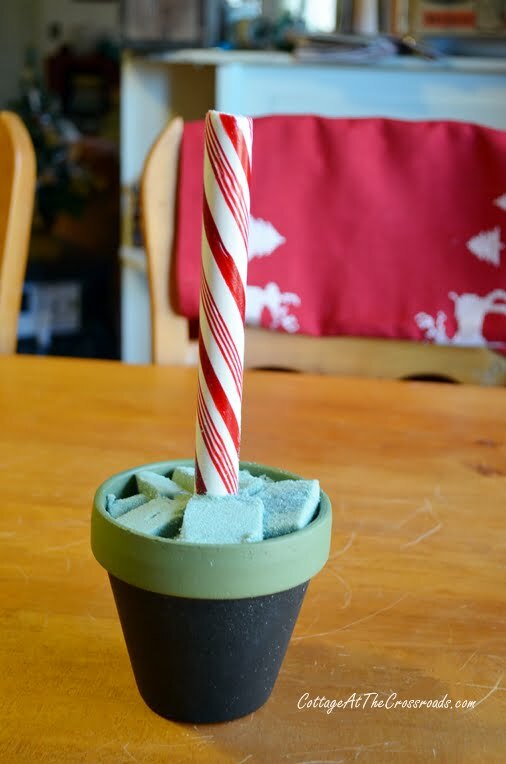 To anchor the candy cane in the pot, I used some floral foam. But my suggestion would be to use a slightly larger pot and put some rocks in the bottom for added weight. The top of the topiary is surprisingly heavy and mine would topple over easily if I didn’t have it in a secure place. I kept putting in small pieces of foam until the peppermint stick was securely anchored into the pot. 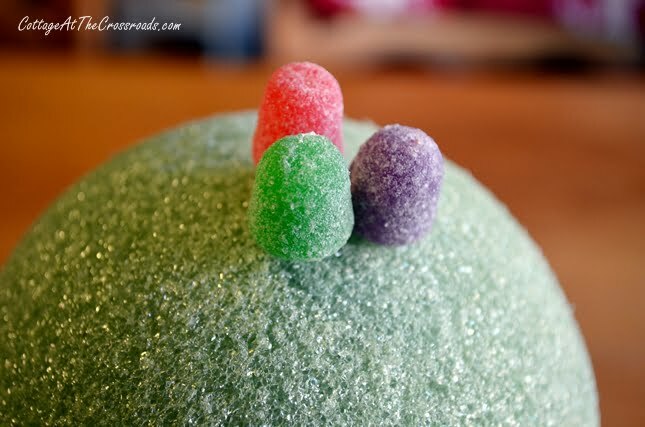 To make a hole in the Styrofoam ball, I just pushed the peppermint stick into the foam. Now you’re ready to start adding the spice drops onto the Styrofoam ball. 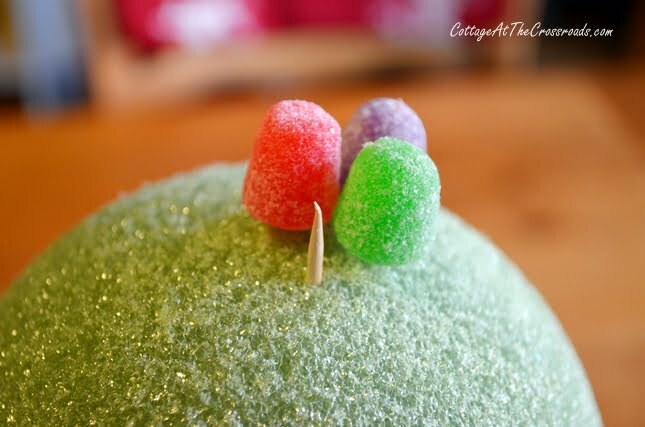 To do this step, remove the ball from the peppermint stick. I used whole wooden toothpicks to attach the spice drops, but it would have made it so much easier if I had cut the toothpicks in half! It was a little hard to push those toothpicks all the way into the ball so I will save you the trouble that I had! Alternate the colors of the spice drops as you are adding them and try not to eat too many of them as you are working. 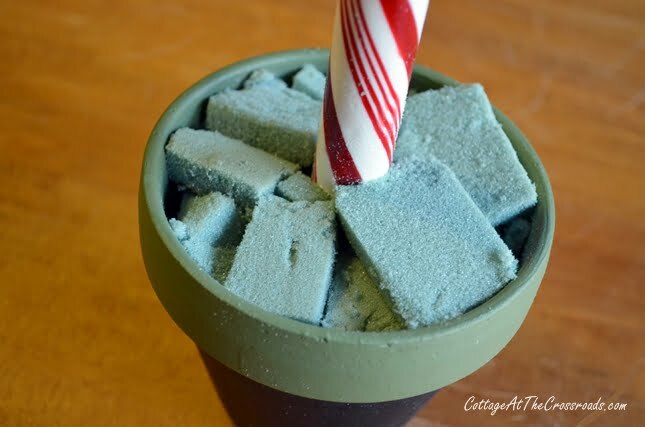 Carefully add the top part onto the peppermint stick and cover the foam in the pot. I used a little green colored moss, but I think some pretty shredded paper would look better. It’s so cute sitting on my kitchen counter, and I’ll show you how it goes with some other things that I’ve made in here soon! Now if only I can keep Leo from snitching those spice drops from the topiary! Ahhh that is so cute Jane. Of course I would eat it all. Oh goodness, Jane. I used to LOVE these spicy gum drops as a kid and haven’t thought about them in forever! 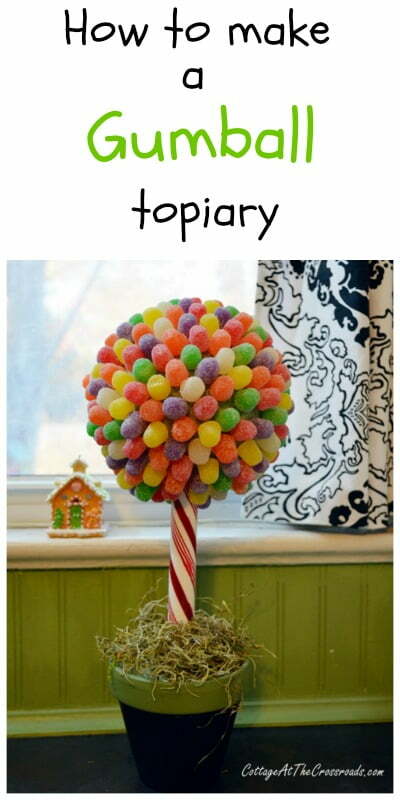 Love your little topiary and really love the candy cane “stem”. Merry Christmas to you and Leo! Jane, This is so adorable. It seems like a fairly quick project. Nowadays, that’s what I need! Love the idea of the peppermint stick. 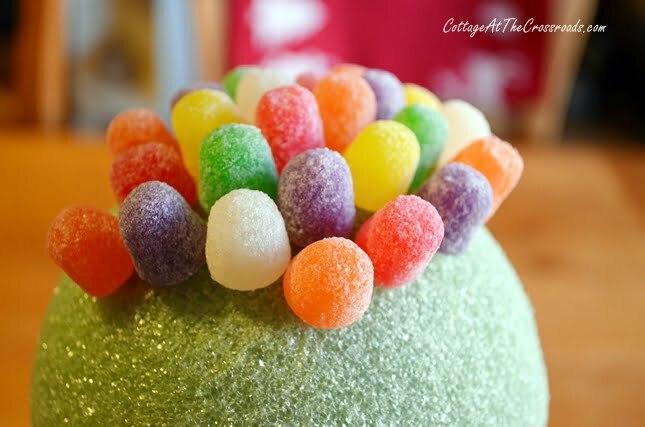 The candies bring back memories of my childhood. 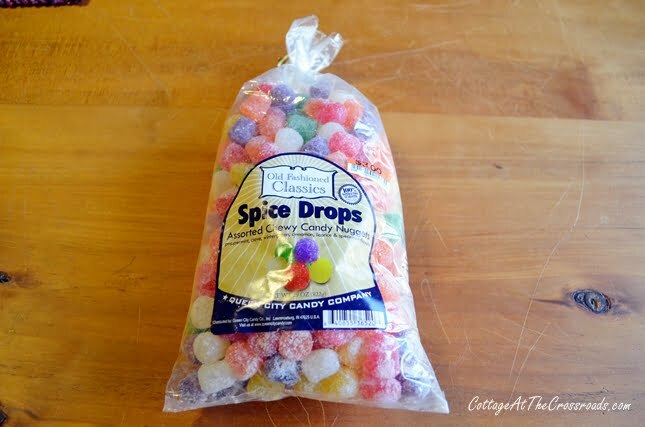 I don’t know if it would work here, we LOVE spice drops! It’s really cute, though! That is so cute and easy. I know my grandkids will love to help me make a couple. Thanks so much for sharing. I like it with the peppermint stick a lot. I’m with you–that crinkled party bag paper in Christmas green or just whatever would look cute. Is that chalkboard paint at the top? Have a SWEET Christmas would be cute around the pot too. Oh I’m way too tired and mind too wound up!!. The way you did it looks great !!! 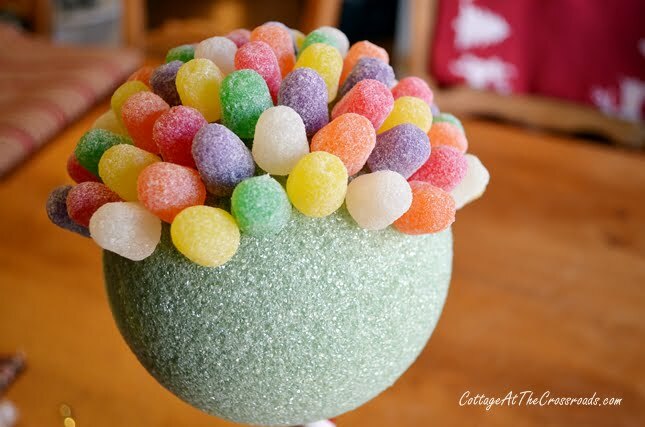 But I’ve never seen big bags of the candy like that…good thing for I love gum drops!!! Mine would forever need refilling too as I’d be nibbling too!! This is really cute. I would love to make one,but I have a cat with a sweet tooth. It wouldn’t last a day with her a round. So cute ! 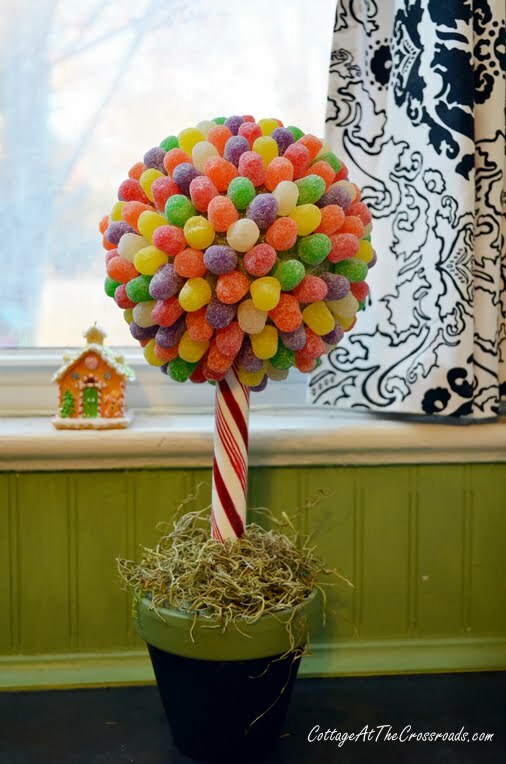 Your gum drop topiary reminds me of the little plastic trees we used to get to put the gum drops on, only yours is cute. Gosh, I haven’t had gum drops in years…or orange slices either, now that I think about it. Hugs and have a great weekend. Cute Jane. Glad my project inspired you. My dogs ate mine too and mine was top heavy as well. Cute and fun though! I’ll miss you in the group.